William Edward Dodd (1869-1940) of the state of Illinois was appointed as political ambassador to Germany in June 1933. He presented his credentials on August 30, 1933 and resigned from post on December 29, 1937. The book scheduled for released today is already #9 in Amazon’s bestsellers list. 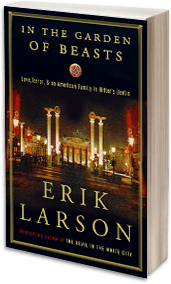 If you have read Larson’s The Devil in the White City  about the 1893 Chicago World’s Fair and a serial killer masquerading as a charming doctor or Thunderstruck  about Guglielmo Marconi, the inventor of wireless telegraphy and a notorious murder in London, this one should not disappoint. When he first arrived in the German capital, Dodd became encouraged by the warm welcome then-President Paul von Hindenburg extended him, for the two exchanged speeches calling for cooperation and friendship between their countries. Soon, however, the brutality of the Nazis became obvious. Within Dodd’s first six months in Berlin, for example, over twenty cases were reported of Nazis assaulting U.S. citizens who refused to yield their salute. This—as well as Germany’s moratorium on debt repayments—disillusioned the former University of Chicago history professor. He spoke against Berlin’s political and economic policies, as well as attacks in the German press on New York Mayor La Guardia, U.S. women and the United States in general. His protests, however, meant little. William E. Dodd’s enthusiasm to work with the officials of the German government under Hitler paled early in his career as the United States Ambassador to Germany. Repeatedly throughout his stay in Berlin he considered leaving his post, feeling frustrated at his seeming inability to affect the Nazi regime or represent the United States as he saw fitting. Finally, he no longer could bear to stay in the Third Reich and in late July of 1937 sailed for the United States to confer with President Roosevelt about his wish to resign, visit a number of important public officials, attend the funeral of a longtime academic colleague and see how the crops fared that year at Round Hill, the Dodds’ beloved farmland retreat in Virginia. Dodd stayed in the United States that visit for two and a half months, returning to Hitler’s Germany only when he could no longer avoid attending to diplomatic duties. On Friday 29 October he noted with resignation in his journal: “In Berlin once more. What can I do?” With little choice but to immerse himself back into the work which had led him away from his professorship at the University of Chicago in 1933, Dodd soon recorded “I have had three busy days reading documents and recent newspapers to get the drift of things”. Check out Erik Larson’s website here. R&R justification for continued eligibility has not been submitted by US Consulate General Hong Kong for 6 years, US Embassy Greece for 10 years, and US Embassy Malta for 20 years. The R&R destination for US Consulate General Naha, Japan is Hong Kong. The R&R destination for US Consulate General Hong Kong is ____ (what is Sydney, Australia??). The purpose of R&R is defined in 3 FAH-1 H-3721.2 as: “Conditions of life at the post present distinct and significant difficulties of sufficient severity to justify temporary relief for an employee and employee’s eligible family members during a period of assignment.” The regulation identifies 11 factors that, at a minimum, are used to justify and approve a post’s request for R&R designation. In designating a relief destination for R&R posts, the location must have a climate, altitude, or environment sufficiently different from that of the R&R post. Another important factor for determining a relief destination is the cost of travel to the nearest point that provides the necessary change of conditions from post. There are approximately 146 overseas missions (at more than 190 locations) designated for R&R in 3 FAH-1 H-3722. The six regional bureaus and nine functional bureaus spent more than $30.8 million (approximately $26.3 and $4.5 million respectively) for R&R travel in FY 2010 (other agencies’ R&R costs are not included in this figure). It should be noted that R&R expenses for Afghanistan and Iraq totaled over $11 million for FY 2010 (more than 35 percent of the Department’s total 2010 R&R expenses). During the inspection, OIG determined that the conditions for which Embassies Athens and Valletta were approved for R&R benefits no longer exist and recommended that the Bureau of European and Eurasian Affairs (EUR) discontinue R&R for both missions at an annual cost savings of more than $180,000. In an informal response to the Athens report, EUR informed OIG that it agrees with the recommendation and is in the process of informing Embassy Athens of its decision to discontinue its benefits. The local conditions cited in Consulate General Hong Kong’s original justification may have changed, and OIG recommended that Consulate General Hong Kong submit justification for its continued eligibility for R&R to the Bureau of East Asian and Pacific Affairs (EAP). Complicating matters is the fact that 3 FAH-1, Exhibit 3722(3) lists Hong Kong as the relief destination for Consulate General Naha, Japan. In response to this review, EAP stated that it is in the process of changing the relief destination for Consulate General Naha to Sydney, Australia. Consulate General Naha’s R&R cost for FY 2010 was more than $14,000; a change in relief destination to Sydney would result in a substantial increase in R&R travel costs. The local conditions at Consulate General Naha may not warrant its continued eligibility for R&R. In addition, Consulate General Hong Kong should be ineligible for R&R benefits if local conditions are suitable for it to be designated as a relief destination. An annual savings of more than $170,000 could be realized if R&R benefits were eliminated for both Consulates General Hong Kong and Naha.